Now, what’s true for natural gas is just as true for clean energy….Because of federal investments, renewable energy use has nearly doubled, and thousands of Americans have jobs because of it. This comparison is grossly inapt. Hydraulic fracturing and horizontal drilling, the technologies jointly referred to as fracking, were first employed in the 1860s and the 1920s, respectively, so they were developed well before government began meddling in the industry. To what extent taxpayer aid either sped up or slowed down the commercial application of these technologies has been debated elsewhere. See here and here for the pro and con arguments on that score. What is beyond dispute, however, is the fact that the fundamental impetus for fracking has been genuine demand for the products it engenders—namely, natural gas and oil. Of their own volition, consumers worldwide purchase these commodities, in order to drive, cook, and heat their homes. 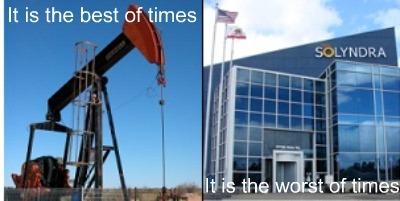 It is this demand that propelled forward the technological advances in oil and gas extraction. The situation is very different for politically favored green energy sources like wind turbines, solar panels, and ethanol. Unlike hydrocarbon energy, consumers generally don’t choose to buy renewables. Why would they? These alternative energy sources are more expensive than conventional energy, and wind and solar power have the added disadvantage of being intermittent, and therefore unreliable. Rather than consumer free will, demand for renewable energy is set by the government. Twenty-nine states have enacted green energy production quotas, known as renewable portfolio standards. This year, the Environmental Protection Agency will require motorists to use almost 13 billion gallons of ethanol. Absent these mandates, green energy would not exist. In the case of fracking, government supports might or might not have accelerated the commercial application of a technology used to produce more of a product that people actually want. In the case of green energy, on the other hand, government supports are essential to the commercial application of technologies that produce a product that people use only because the government forces them to. When it come to technological breakthroughs in energy (and all other sectors of the economy), it’s the demand, stupid. As such, the President is wrong when he claimed that “what’s true for natural gas is just as true for clean energy,” because there is no demand for renewables, only mandates.